Today is National Pizza Day which is different than National Pizza Week or Month but still an important day to just honor our loved one: pizza. But as we do, we have to gear up for another love buzzing around us right now as Valentine's Day looms ever closer. February 14 is a day for lovers. But for lovers of pizza it is also a great day to offer some great deals. #1 Offer a heart shaped pizza for a limited time. If you don't have one, here one from the PMQ Recipe Bank. This is a fun food item for people to order for their loved ones during the holiday (or any time). Plus, it can be a great marketing tool as Jet's Pizza found out when recently in the news for their pizza heart. #2 Have a Valentine's Day special menu. 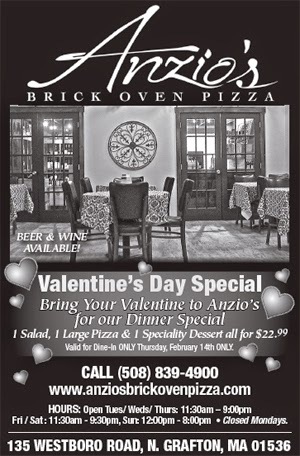 Over at Anzio's Brick Oven Pizza, they created a special date menu with salad, pizza and dessert. Make your place the best to dine-in for the big date night not just by providing special menus but adding special touches with specialty drinks, desserts or fun decorations. #3 Add a bonus item to delivery. Pizza 73 in Canada will be delivering movie tickets with its heart shaped pizza to lovers this week. Team up with a local business to offer a Valentine's bonus for your delivery. #4 Completely transform your pizzeria for the day. Make reservations required. Make more romantic table top decorations including candlesticks and fine china. Go all out to make your place the place for lovers for that night! Frankie's Pizza and Grill is a great example of how to do it. #5 Don't forget social media! Be sure to share any of your valentine perks on your social media and give people enough time to learn about them. Many have made their plans well in advance so be strategic!